From character hacks, to stage hacks, now to audio hacks. Nice textures by the way. Omega Ridley, re-read the post. pokegods. Like pikagod and that dark skeleton charizard thing on pokegods island. Venastaus, mewthree, and other pokerumors. @blood: LOL, Pokegods. I’ll look into that. textures? Your textures are great. I really would like to use it in brawl. You can download textures either at Stack Smash (the revealed ones, anyway), and one or two spares over at the Kitty Corp. forums. It’s such a shame that there is a limitation thing that is making our life tough. Anyway, I really like your MOTHER textures! Lucas into Kumatora (boy into girl..awesome! XD)and Ness into Porky! I also like Hinawa. I hope that you can provide your textures someday. Anyway, KEEP UP YOUR WORK! 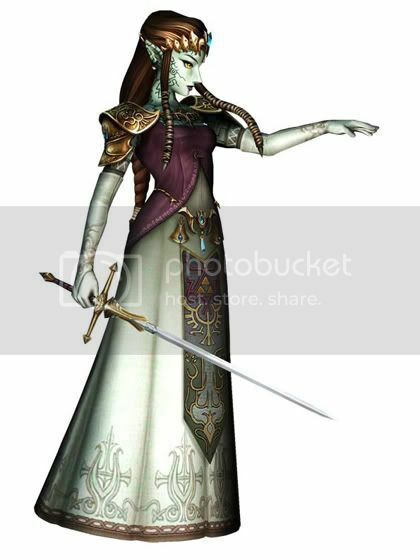 Zelda as Vaati, eh? That’s different. Giygas. you must have Giygas. If you cannot grasp the true form of giygas I will help. Giygas will be the ultimate psa. Giygas needs his own hacked stage. Giygas Giygas Giygas Giygas Giygas Giygas Giygas Giygas Giygas Giygas. Better believe Giygas is always top priority… when it comes to stages, anyway. The main platform’s colors altered to white primarily with a lighter blue as the secondary color. @Mura: You can bet a version for him and Young Link have been under works… It’s just a matter of release, and some finer tuning on my part. While I like the concept, it’s impossible for me to change the Final Destination stage’s actual colors (the stage consists of CLR0 coloring, which I have no idea how to edit)… and the background consists of a lot of (normally colorless) flowing images. So like Giygas Destination, what I edited is really all I could do to it. lol my friend just gave me a funny one. Jiggs = the “Easy button” from Staples depot. I miss Mewtwo. And Arceus is awesome. I think you did a Arceus Lucario for Brawl, any chance of an Arceus Mewtwo in Melee? Also, Roy as Pit would be pretty cool. As for Roy-Pit, I’ve been thinking about transferring Brawl character textures into Melee in general (the “Brawl exclusive” characters, that is). Also another idea, any chance of a Twilight Realm stage hack for Temple? That’d be pretty boss. No rush on this one though, unless you really want to do it, after trying to figure out texture hacking myself, I;m pretty sure doing a temple texture could take hella long. Would any of the neutrals (Yoshi Story, Fountain of Dreams, Final Destination, Battlefield, Dreamland, Pokemon Stadium) be hackable for you? ^ That was an idea I’ve been thinking about for a while, too, but I’m too lazy to do anything with it as… well… Viewtiful Joe, I’m not familiar with. But we’ll see. Shouldn’t be too bad. can i make shadow pikachu,and Shadow jigglypuff? 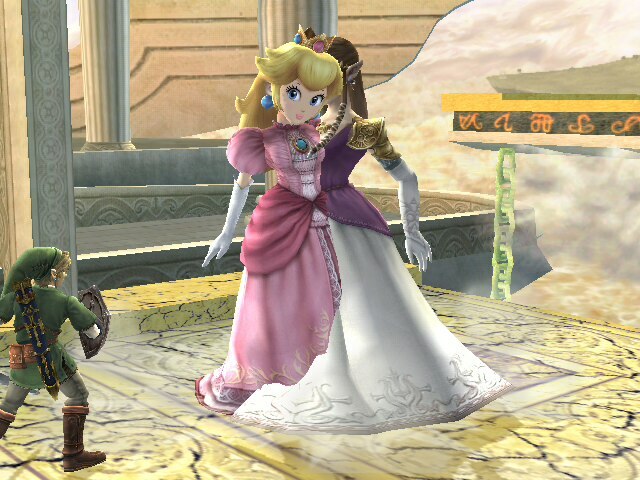 In Super smash Bros. Brawl. Maybe the sprite version of Dr. Mario? With grey hair and the like? Can you please fix Batman / Black Captain Falcon? He is too dark! He cannot be seen that well on Battlefield / Final Destination / dark stages. I’ll look into it; I haven’t exactly used him in battle myself yet (was saving a CD burn for another time; tested him in Dolphin). @Mewzard64: What exactly do I base GB Pikachu off of? He has quite a few GB sprites to choose from; which specifically? His Pokemon Red/Blue sprite I guess, you maybe should make an audio hack to go with it. Yeah I have another suggestion, Peach as White Mage. If your wondering what white mage, I’m talking about the one in Mario Hoops 3 on 3.
sorry if it’s too many, hopefully you can do some at least though! I’m just wonder when are some of these Melee textures going to be downloadable? Fire Mario and Fire Dr. Mario would be pretty cool to have. Thanks for reminding me, Masked Nightmare; I need to make a more convenient link here at the site. I was wondering if you ever made a Brawl Marth texture? But it doesn’t seem to be in Stack Smash’s Released Contents? ^ I believe I added that sound effect to Ganny, where he has the really heavy breathing. S., do you mind releasing Samus’s gold charged shot next week so I can burn a new disc for an upcoming big NC tournament? We’ll be holding all of the three games and Brawlplus, and I’d like to be able to show off your work. And I reeeeeeally like that charge shot. How about… Kirby as an unarmored Meta Knight? And I mean as in like that one in SSBB made by Bossofthegame. ^ Mm, so long as I don’t have to make the shoes. Kirby’s shoes are mirrored front-to-back on Melee, whereas in Brawl it’s the more effective side-to-side mirroring. Ew, they actually had it that way back then? ._. Lol, I guess it’s no sweat if the shoes have to be done differently for it to work – I mean, I’m not the one making the texture, so I shouldn’t talk but… Pretty much forces you to make ’em more simple than the ones in Bossofthegame’s texture. Could you do Malleo, Weegee, & Yushee at least? You guys should make a Stage section . . . yeah . . . do it. Could you make a Viewtiful Joe Captain Falcon using his RED costume? I think that’d be pretty cool. Thanks. Green Falcon as Green Lantern? i would really, really like a nighttime version of dreamland. I’d be happy with just cool recolors of DK if stuff isn’t going to work with him. 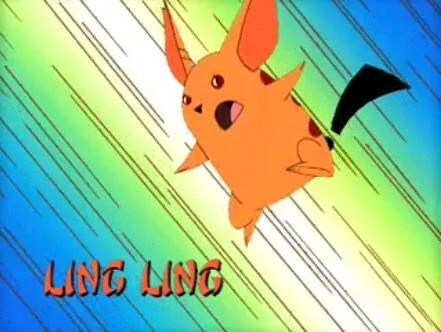 Can you make Ling-Ling from Drawn Together over Pikachu? it’s really possible to vertex hack ? i will try if yes. Give your email right here in the suggestions and I will give you the gratest pictures of the Brendan Hack you’ll ever see. just a few ideas for now. Great work! haha and some form of Majin Buu from DBZ for Mewtwo if possible! would be amazing! Up/Down/Side Smashes: Ganon’s roar when he slashes one of his swords. Taunt: After Link delivers the final blow, Ganon does a series of roars and flails his swords around widly. Just one of those roars would work really good for Bowser’s/Giga Bowser’s taunt. Heavy Damage (like Bowser’s Sound Test sounds #’s 14 and 15 in Melee): Ganon’s roar when hit in the face with Link’s Light Arrow. KO’d off bottom or side of stage or Foresight (hits the screen after KO’d): Ganon’s roar when Link attacks his tail. Star KO’d (sent flying in the background): After Ganon’s series of roars while flailing his sword, he finally does one last longer “roar” while Zelda shouts “Six sages, now!”. That’d be really good for his Star-KO’d roar. I haven’t seen anyone post this idea anywhere, so I thought I’d suggest it to you. I guess for the texture Bowser’s/Giga Bowser’s shell could be the color of Ganon’s tattered cape, and his eyes could be solid yellow or solid white, like Ganon’s eyes in OoT. And I guess Bowser’s/Giga Bowser’s spike cuffs could be textured like the cloth on Ganon’s wrists and shoulders, and his scales could be the color of Ganon’s skin. And some other things could be applied too. I would really love to see a port of the billy mays texture for ganondorf. This is probably a lot to ask for, but in the future it would be excellent if each texture could be applied to any color you want (as in, a download link for each color). This would allow people to mix and match the textures they want especially if some cover the same color. http://fc09.deviantart.net/fs51/f/2009/300/f/4/The_Giants_Have_Merged_by_shinco.jpg The picture is zelda and peach merged like conjoined twins, specifically the Dithoracic Parapagus formation. But instead of in front of one another could you make them more side by side. If you could do this, it would be EPIC! how to send to illusory labyrinth?? I have a question, Could you release some of the textures that are in your video until you get your Wii working again? Like Wegee, Zora Link, and that altered Ness? Edit: I meant videos not video sorry for the grammar error. Sorry for triple posting but could skull kid (MM) be an option for Young link (To replace the red costume.)? Probably won’t get anything up till after the 17th. More Donkey Kong textures such as Gutsman or some Megaman textures. Actually instead of Gutsman can you release Oozaru? Suggestion, how about the Fighting alloy team? Red and Blue Alloy. I while playing a game of brawl with a friend of mine had an idea. 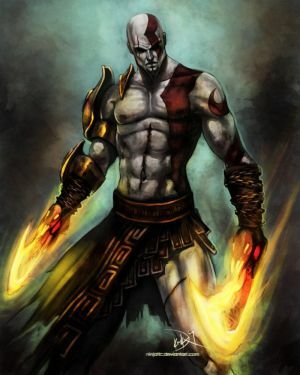 How about Wingless Pit as a texture to replace Roy’s red costume? omg at Pit-Roy Dragoon Fighter XD I’ll have to look into that one. I thought it would be very fitting. Link from the NES LoZ: red tunic (that is, from the Red Ring) and wielding the Magical Shield and Magical Sword. This would make my life. all i want is a really epic looking marth or roy. Preferabbly Marth. Yeeeeeeaaaaaaaaaah. oh! and a red(instead of purple) final destination. Or Rainbow!!!!!! (maybe not) if you have time…..pleaseeeeee? also, if u have time, i would like to know what kind of SDK u use. if u want just send a link to my email, cody0596@gmail.com Thanks! As for SDK… I’ll see what I can do. it may take awhile, but a pichu/pikachu vertex hack to make them flareon! i think that would be beast! I have a couple ideas for textures: Scorpian Cpt Falcon and Vageta Falco. I just saw a Mango video with Falco looking like a super saiyan, and I was wondering where that texture was. i thought of this before then, but I was wondering if it got done. This one’s for good ol’ Melee! Can you make Mewtwo’s dark power stuff look more like the Aura for when playing as Lucario? Here is obviously it is because suggestions!!! Ooh, ooh, GODZILLA over Giga Bowser!! Lelouch over Marth. It’s been done on Brawl. You know the hand boss in Mario 64 thats trying to grab you all the time? They would make an awesome Master hand/Crazy hand couple! Dunno if imagecodes work or not..
Hey, so you mentioned in a couple character texture hack pages that you can move color specific texture hacks to different colors (like moving NES Peach from PlPeNr to PlPeWh for example). Where can we post requests for that, and where can we get in contact with you to receive your modifications? PM? Email? First off, thank you SO MUCH for everything you’ve done. 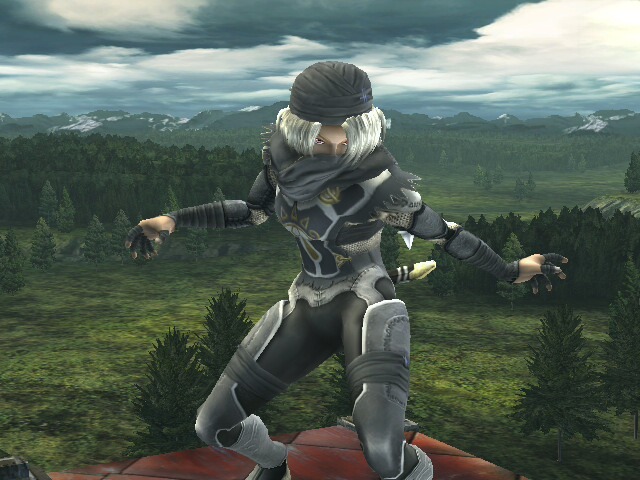 I’d like to suggest a version of the “Fierce Deity” skin that Link has, but done on Marth instead, if that’s possible. White eyes and facial tattoos, corresponding light and dark parts, similar sword. Thanks in advance!! Mario kart alternative of the Mute City stage. If one could make the f-zero cars look like the mario gang racing through the course I belive it would look amazing! If you could make DK look like the Incredible Hulk that would be awesome. You guys should really really REALLY upload all of the music hacks (****ing megaupload) it’d be amazing oh and everything here is freakin awesome! For Melee, by the way. Striker Bowser from Mario strikers!